Matt Mikalatos: Guest post from Tony Kriz, author of "Neighbors and Wise Men." 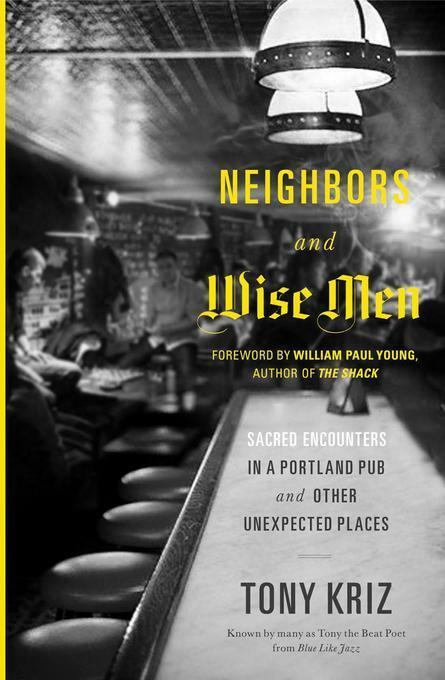 Guest post from Tony Kriz, author of "Neighbors and Wise Men." Here's the thing about Tony Kriz. I think he knew all my friends before I did, especially here in Portland. People mentioned him all the time, but I never seemed to run into him. But then last year we crossed paths at a writer's conference, and then again a couple months ago at a fundraiser and then, finally, we went to coffee together and now, I can honestly say, we are friends. Finally! Tony agreed to write this guest post for BHR, and I was surprised when I read it. Surprised because I was moved by it, and it challenged me. I probably shouldn't have been surprised. People are saying a lot of highly complementary things about his new book, Neighbors and Wise Men. So, if you enjoy the post you should go check out his book. In the meantime, here's Tony's website and his Twitter account. People are everywhere. You know what I mean? I can’t seem to get away from them. Take downtown Portland for instance. Downtown Portland is full of them. It is like walking through an anthill or living inside a pinball machine. Bodies everywhere. Most of the bodies don’t even know I am there. They are content with the companionship of their agenda or their handheld mobile devise, so I return the favor. Okay, here’s the deal. I don’t even remember his name. Truth be told, I don’t think I ever took the time to learn his name. This is just the beginning of my sickness… I mean… well, more on that later. I was downtown. It was maybe 8:30pm on a Thursday evening. I had managed to find street parking (score!) just a few blocks away from Jake’s Grill on Tenth Street (not to be confused with Jake’s Famous Crawfish, which is up on Twelfth.) I was hurrying to meet my friend Wilson. It was a lovely evening, warm, and the streets were hopping. I was on my cell phone chatting with an old roommate from college named James. We hadn’t spoken in years and we were getting caught up. I passed the culinary school and came to the corner just across from Jake’s. The grill is situated on the Northwest corner of the old Governor Hotel, a beautiful landmark just ten blocks from the Willamette River. As I strode onto the sidewalk, I could see Wilson through the window. I waved with my free hand and prepared to enter the brass and glass doorway. Before I could reach the handle a tall figure suddenly blocked my path. He was a few inches taller than me with scraggly blonde hair and a soiled red flannel. His hand was extended and his eyes were pleading. “Hold on a second,” I said to James. “What do you want?” I asked tersely but politely to the gangly man. “Do you have a dollar?” he replied. “Okay then,” I said, “let me see if I have the change.” Using my one free hand, I scratched through my wallet and front pocket and soon handed the man three one-dollar bills and two quarters. As I placed the money in his hand, his eyes were wide as a pepperoni slice. He balled the money in his fist, flashed a full smile and turned to clunk back up the sidewalk. Poor James, he had just sat through the whole thing. I am sure it was quite a drama to behold through the handset. Unfortunately the drama was not over. As James and I tried to restore our dialogue, I once again heard the sound of the gangly man’s boots, but they were not headed away from me… they were headed directly for me, at me with intention. He had target lock. The blow sent my phone sailing untethered into the air and then crashing to the sidewalk some eight feet away. Plastic-formed and electro-fancy pieces cracked and bounced in separate directions. Like the cry of the humpback whale came the gangly man’s voice from behind me. I spun to see him: body limp, jaw hung and clinched knuckles dug into the rubbery centers of his cheeks. “What have I done?! What have I done?” His eyes now fixed on the disparate phone pieces around the sidewalk. He couldn’t stop wailing. The sidewalk stopped and gawked. Finally, he snapped from his horror and looked into me. Most days I walk around in a trance. In my trance I divide the humans I pass into two categories. Some are filed away as “people” but if I am honest, most are dismissed as “objects.” These objects are of no more consequence than a lamppost or a mailbox, mere obstacles of inconvenience. Then the gangly men come along. The gangly men are the conduits of God’s grace. They rescue me from my trance. They remind me that I am not just an object. I am a person. I guess you warned us, but this post should come with a Kleenex advisory. I'm always so thankful when God in his grace sends me a gangly man.